An kitchen aid that helps one to easily separate the shell from an egg. 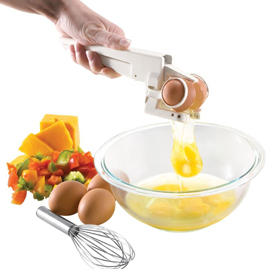 Simply put the egg in the clamp and use the handle to extract the shell from the egg. This inexpensive tool works well at preventing tiny pieces of shell from reaching your food.